Unless otherwise indicated, all photos on this page are credited to Nasa. Venus is our nearest planetary neighbour in space, and for a long time was thought to be quite similar to our own planet Earth. However it has become increasingly clear in recent decades that this is far from being the case. 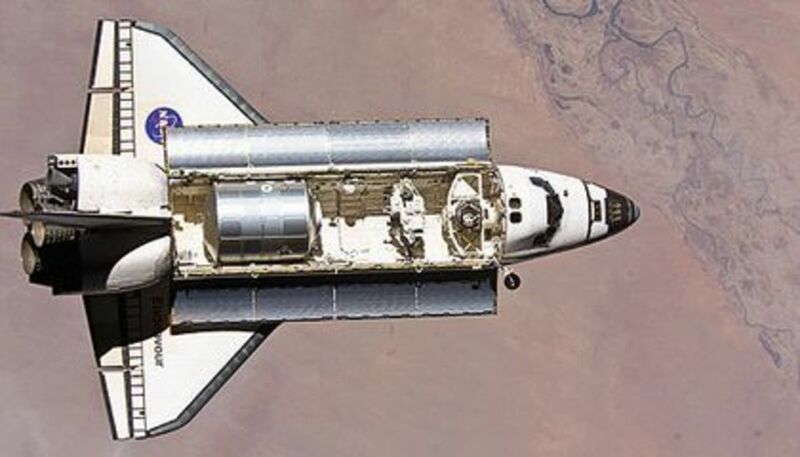 More than 30 spacecraft since 1962 have visited the planet, and more than 20 of these missions have sent probes into the atmosphere or to land on the surface. Others have been entered into orbit around Venus or have imaged the planet during fly-bys. And yet despite all this close attention, our knowledge remains limited, as more questions have been raised than answered. The reason why this is so is due to the violent geological history, and very alien climatology of Venus, and in this page I hope to make clear the sequence of events which may have made Venus so different to the planet so often considered its sister in space - our own planet Earth. The science behind this is very complex and confusing, (particularly the science relating to magnetic fields and greenhouse gasses), yet my desire is for this page to be readable and quite easy to follow. Therefore, detailed science will be limited, but numbered references will link at the bottom of the page to further, more involved reading. Hopefully the information will be comprehensible, logical and up to date - if not, please let me know, and I will try to amend it accordingly. This page is the second of two pages about Venus. Page 1) A generalised overview of our current state of knowledge. Page 2) A more comprehensive study of the geology and climatology. Few good quality images were taken of the surface of Venus prior to the 1980s. This was because hostile conditions on the surface brought about the very rapid demise of most lander craft soon after touchdown, and the planet's very thick atmosphere was quite impenetrable to conventional photography. Then in the 1980s and 1990s, advancements in radar imaging enabled the clouds of Venus to be penetrated at last, and the pictures on this page are the result of that new technology. It should be pointed out that most of these images cover a vast scale (several hundreds of kilometres) and are taken from altitude. The vertical scale of many photos (height) has been greatly exaggerated to enhance smaller surface features. Colour where applied is false, but is based on photographic images from earlier missions. The discussion on this page will comprise two main parts. These are the clues which help us to understand how this planet came to be in its current form. The evidence of basic physical characteristics, the evidence of Venus's magnetic field, the evidence of the known physical and chemical characteristics of Venus's atmosphere, the evidence of Venus's topography, the evidence of craters on the planetary surface, and the evidence of plate tectonics. Likely scenarios for the very ancient history and the more recent history of Venus, based upon the evidence. 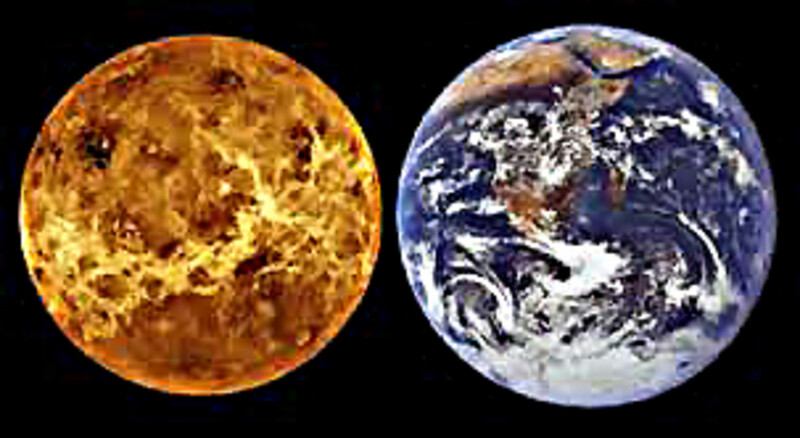 Before the development of new technology and space probes enabling us to study its atmosphere and surface features in more detail, Venus was frequently portrayed as Earth’s twin. In many ways it still is. Venus is our nearest planetary neighbour, it is of quite similar size, with similar density, and it has a similar gravitational strength to Earth, which all suggests that the basic composition and physics of the planet should be similar. It is believed that Venus, like Earth, should have an iron/nickel based core approximately 6000 km (3,700 miles) in diameter. The next layer, called the mantle is probably about 3,000 km (1860 miles) thick, and the crust of Venus should be between 25 km and 60 km (15-35 miles) thick. 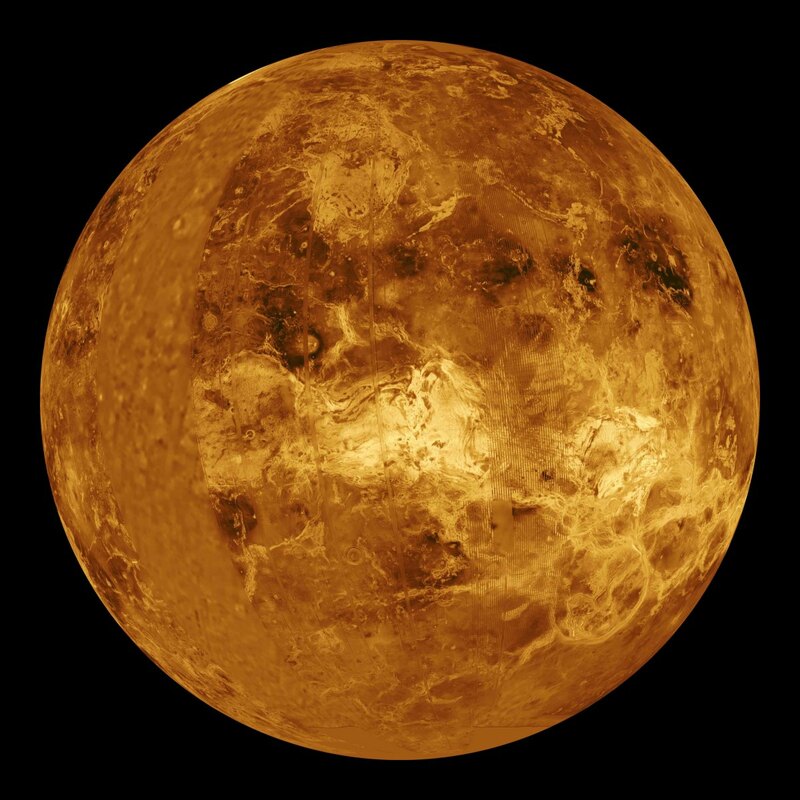 Venus, being closer to the Sun, would presumably not only be hotter today, but would always have been hotter. 1) Venus is 95% of the size of the Earth. The size discrepancy on the face of it may not seem significant, but this will have some implications for such factors as internal heat generation and core pressure. 4) If Venus, by virtue of being closer to the Sun, has always been hotter than Earth, this would clearly have had some effect upon the development of the planet. Quite how big an effect could only be speculated upon until recently. The evidence of the basic physical characteristics of the planet therefore suggests that Venus’s interior should really have a fundamental similarity of composition to the Earth, and if there are any differences, then these need to be explained. The slow retrograde spin suggests a violent past, and this, plus the absence of a moon today, may have had implications for the planet's long term evolution. The question of Venus's presumed higher atmospheric temperature than Earth in the early days of the planet's existence, needs to be always borne in mind for the influence that it may have had on the planet's subsequent development. At least one, and maybe all of these fundamental issues, must be assumed to be critically important in explaining any differences which developed between the geologies and climatologies of Venus and Earth since the earliest days of the formation of the two worlds. It could be that the atmosphere and surface temperature of Venus are extremely high, comparable to that of the mantle, so little convection and escape of heat occurs for this reason. The second possibility is that the Venusian surface - unlike the Earth's - is rigid and unyielding to heat exchange; this could only be the case if Venus lacks the crust and mantle interactions brought about by plate tectonics (continental drift) on Earth. 3) Planetary rotation. The rotation of Venus on its axis as we have seen above is much much slower than that of the Earth, and a counter view to heat flux in the core or the mantle, is that planetary rotation may be a key factor in the generation of magnetosphere-inducing convection currents. However, calculations suggest that if even with Venus's slow rate of rotation, a more substantial magnetic field should be generated than currently exists. So it seems likely that planetary rotation is - at best - a contributory factor in generation of convection currents to the solidification process described above. It is therefore generally believed now that convection processes responsible for the magnetosphere begin in the core, not in the mantle, so the evidence of a weak magnetic field suggests a uniform core without any solidification process to generate convection currents, possibly with Venus's slow rotation rate as a contributary factor. A high surface temperature, or a lack of variation in temperature throughout the mantle due to an absence of plate tectonics, would reduce convection within the planet. Whether this would have a significant impact on the generation of a magnetosphere is debatable, but it is mentioned here because certainly it is a factor which may have other implications for the development of Venus, and it is a factor to which we will return in the section on PLATE TECTONICS. 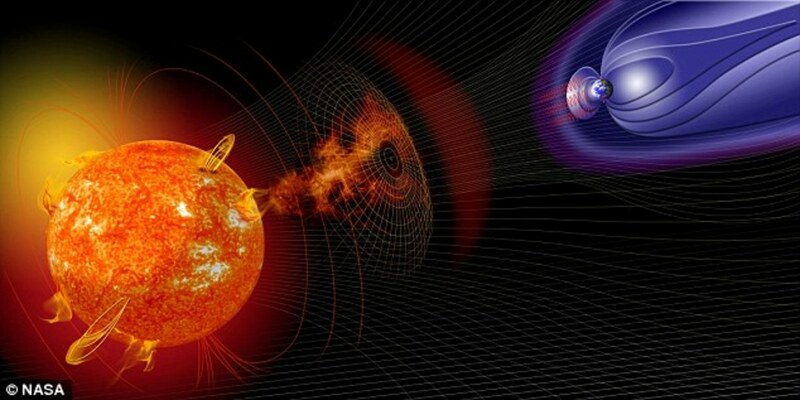 Having considered the possible CAUSES of Venus's very weak magnetosphere, we should also consider the possible EFFECTS of a weak magnetosphere. Mercury and Mars are relatively small planets with both low gravity and weak magnetic fields - as a result these two planets have non-existent (Mercury) or very thin (Mars) atmospheres. By contrast, Venus and Earth both have very sizable gravitational forces enabling them to hold on to all but the lightest atoms such as hydrogen. This should ensure that both planets retain a complex atmosphere. However the effect of the Solar wind on Venus and Earth's atmospheres will be very different. 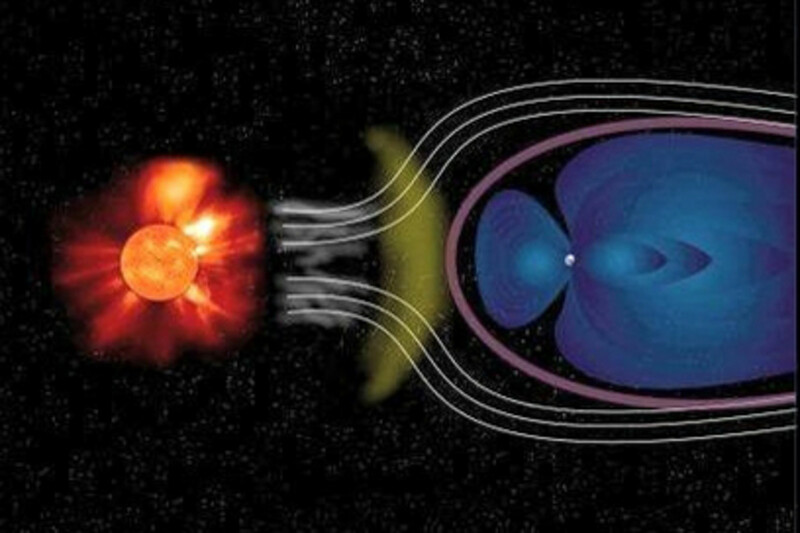 On Earth, the strong magnetic field deflects much solar radiation. On Venus, absence of a significant magnetosphere will allow much more of this radiation to enter the atmosphere, which may have repercussions for the characteristics of the atmosphere. It may not have removed the atmosphere (far from it in fact - Venus, as we shall see, has an atmosphere which is extremely dense) but it may have had an impact on significant parts of the atmosphere (notably the component atoms of the molecules of water vapour). This is one aspect which we will consider in the next section. It has been suggested that just as the physical characteristics of Venus would once have been quite similar to that of Earth, so the primordial atmosphere of Venus would also have been comparable. Assessing the hypothetical temperature of an Earth-like planet at Venus's proximity to the Sun suggests that Venus in the past would always have been hotter than Earth, but maybe not too hot for abundant supplies of water to exist on the planet's surface. And it is reasonable to suggest that the mechanisms which released or supplied water to the surface of Earth (released from internal rocks or supplied through cometary impacts), should also have allowed water to exist on the surface of Venus. With a similar geology, a similar atmosphere, and with hypothetical oceans of water, Venus really would have been Earth's twin. However, investigations of the planet's atmosphere in the second half of the 20th century have revealed that - whatever Venus was like in the past - today it is extraordinarily different. Venus has been discovered to have an immensely thick atmosphere which comprises 96.5% carbon dioxide, the density of which exerts a crushing pressure at the surface 92 times greater than on Earth. Nitrogen makes up most of the remaining 3.5%, with small amounts of sulphur compounds and clouds of sulphuric acid in the upper atmosphere. Trace elements include inert gases. 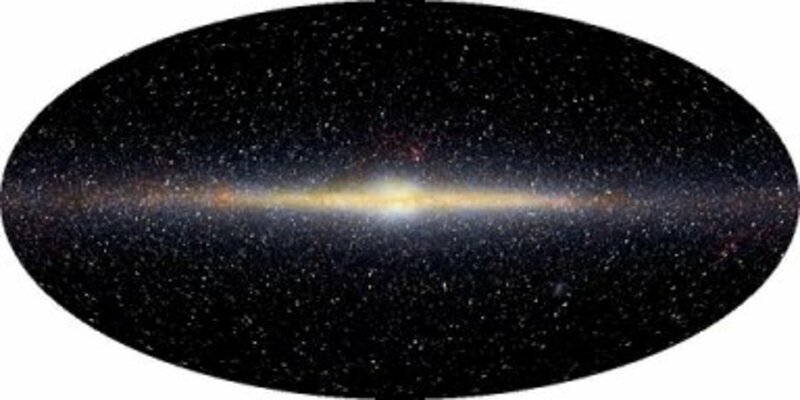 Oxygen - and ozone - are sparsely found. One other curious aspect of the elements to be found is that where hydrogen exists in molecular combination, (such as in sulphuric acid) the heavy isotope of deuterium is 100-150 times more abundant than anywhere else in the Solar System. This will be mentioned again shortly. Wind speed at high altitude is impressive. Speeds of up to 500 kilometres per hour (311 mph) drive the cloud cover round the planet. And one other characteristic of the upper atmosphere is lightning, which must be explained (and will be towards the end of this page). The high initial surface temperatures on Venus. High initial temperatures, whilst permitting water to exist in liquid form for many millennia, would nonetheless have brought about a much higher rate of evaporation on Venus. This would have led to greater concentrations of water vapour - H20 - in the atmosphere, and diminishing amounts of liquid water on the surface. These two factors therefore will lead to a continuous diminution in the volume of water on the planet's surface and in the atmosphere. Water is one of the major factors involved in the carbon cycle on Earth which effectively locks up carbon in the water, in rocks and in living organisms, rather than in the atmosphere. Without water the carbon on Venus remains and accumulates in the atmosphere leading to the well-known greenhouse effect and ever rising temperatures. More will be written in explanation about the mechanism of the greenhouse effect later. At the moment however, it will suffice to say that Venus is now known to have an extraordinarily high atmospheric and surface temperature - far higher than that which existed after the initial violent upheavals which the Solar System and Venus underwent. As we shall see in due course, the implications of this may extend not merely to the surface crust, but far below the surface of the planet into the mantle. And it is the crust and the mantle which we will consider next. Two great shield volcanoes in Western Eistla Regio. Sif Mons (on the left) rises 2 km (1.2 miles) above the plain, and Gula Mons (on the right) is 3 km (1.8 miles) high.The distance between Sif Mons and Gula Mons is about 730 km (450 miles). 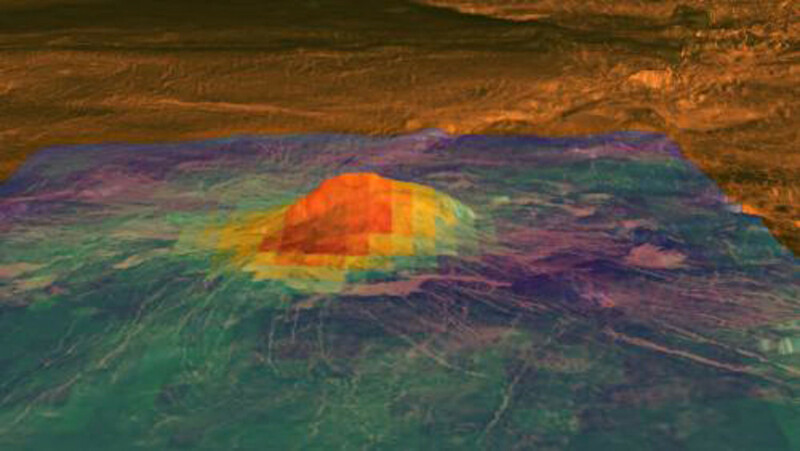 Sapas Mons, one of the giant shield volcanoes of Venus. In recent decades the surface of Venus has been shown to be characterised by features of which some are familiar, and some are very alien, but almost all are related to vulcanism. The surface features are dominated by great volcanoes, vast plains, and extensive upland areas. Many tens of thousands of volcanoes, including hundreds of giant volcanoes, dot the surface, vast in area, but relatively low in height, and surrounded by lava flows which in one case extends for 7000 km (4300 miles). Some of the volcanoes are known as pancake domes because of their characteristic, flattened shape, less than 1000m high yet many kilometres in diameter. On Earth, two main types of volcano exist. The typical volcano cone-shape is associated with so-called composite volcanoes such as Vesuvius, Krakatoa, Mount Etna and Mount St.Helens which are to be found at or near the edges of tectonic plates. Subduction of the crust into the mantle and influx of sea water creates a highly viscous lava leading to explosive eruptions. Shield volcanoes are rather different. These are to be found at hot spots over the mantle, and eject magma which is much more fluid; this leads to less explosive eruptions, but more expansive lava flows. The volcanoes of Hawaii are typical shield volcanoes, and the form and distribution of volcanoes on Venus suggests that these are also of the shield type. As such, it seems they are not the result of plate tectonics. Speculation exists as to how these mountainous regions were formed. On Earth, mountain ranges are the result of folding and faulting processes at the edges of tectonic plates. The Himalayas, for example, were created as the Indian continental plate collided with the Asian plate. 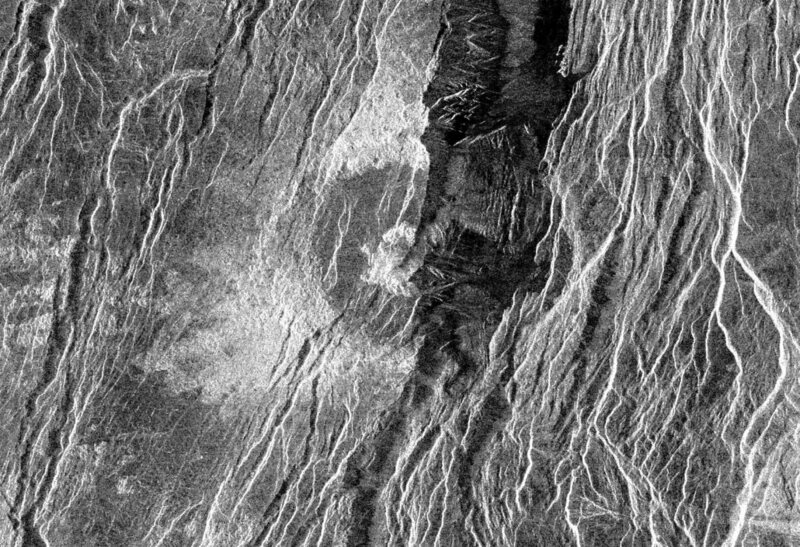 On Venus, similar processes might also have produced massive folds and faults and upheavals in the crust. But we have already raised the possibility in the section about the magnetosphere that Venus may actually have a rigid surface crust, lacking plate tectonics. And we have already seen in this section that none of the volcanic activity on Venus appears to be related to plate tectonics. 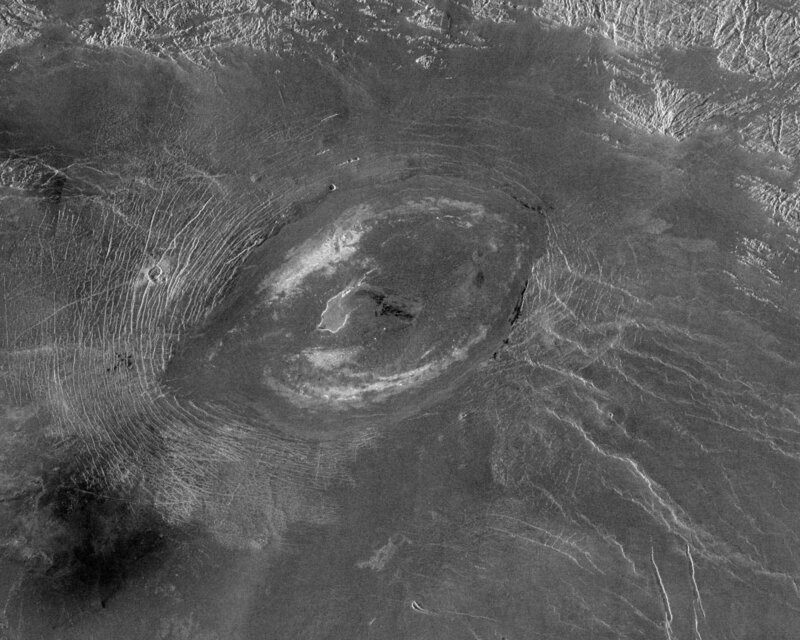 If this is the case, then another explanation for mountain building on Venus will be required. This will be discussed further under EVIDENCE OF PLATE TECTONICS. To reprise - this section on surface topography has shown that the Venusian surface consists of shield volcanoes and other structures which may have volcanic origins, vast lava plains, and extensive highlands. Why are Venus's volcanoes typically of the shield type, and why are they so extensive? How do we explain their distribution on the planet's surface? What is the origin of the other structures mentioned in this section; the coronae, novae and arachnoids? Why does Venus feature such extensive lava floodplains, so rare on Earth today? 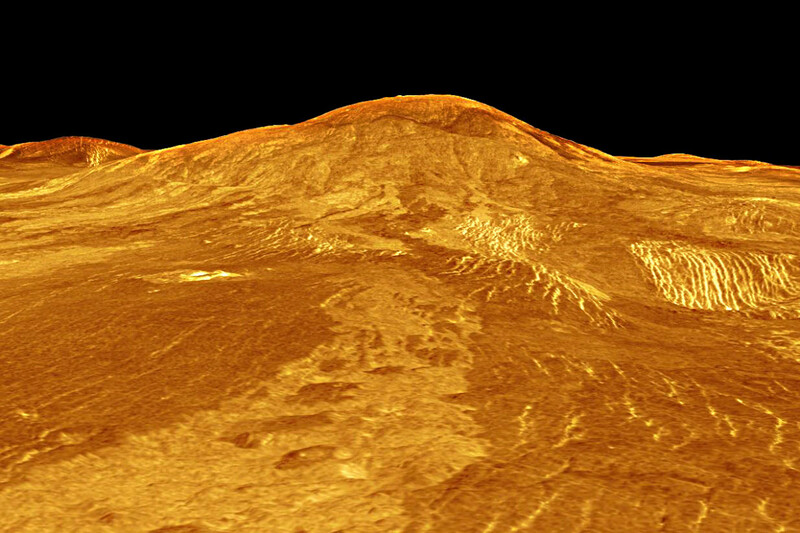 How are the highland regions of Venus formed? By plate tectonics bringing about the folding of the crustal rocks? Or by some other means? 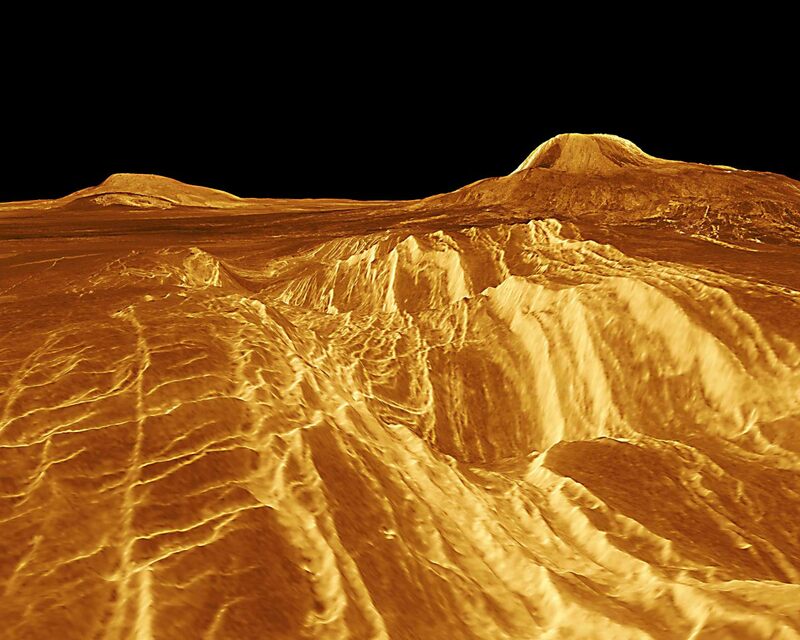 Why are Venus's mountain ranges so broken and deformed by the strange tesserrae formations? The answers to all these questions will be speculated upon further in the section 'EVIDENCE OF PLATE TECTONICS' but first we must consider one other group of features of the Venusian surface, which are not created by Venusian geology, but which may hold a strong clue about past processes and present activity on the planet's surface. These features are meteor impact craters. Although impact craters derive from the collision of meteors from outer space, they nonetheless can tell us a great deal about the geological activity or climatological activity of the planet. The reason for this is that on a geologically active planet, craters will in due course be obliterated by lava flows, folding and faulting, or sedimentation. Whilst on a climatologically active planet, erosive forces such as rain, rivers, wind or ice, will soon degrade craters. 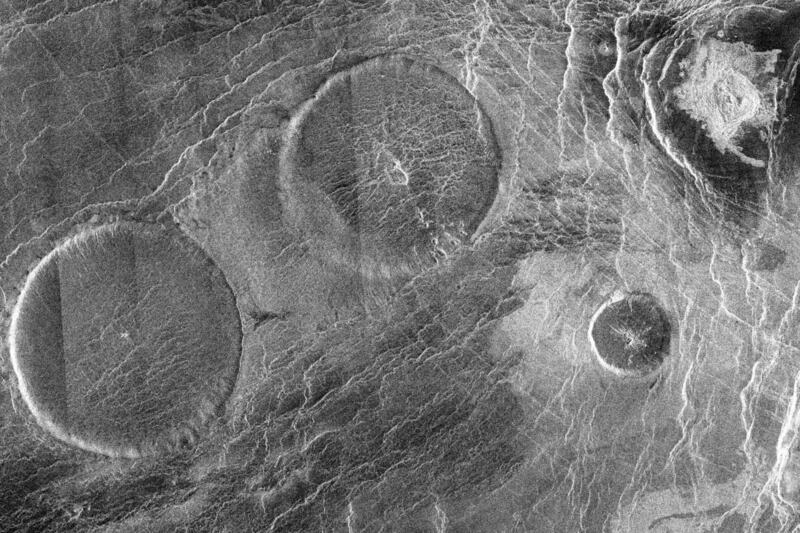 On Venus, virtually no craters smaller than 2 km in diameter exist. Craters instead tend to be large, and are often grouped together in a clustered manner. In total, Venus has approximately a thousand of these larger craters - many more than on Earth, but far far fewer than on other, possibly comparable, worlds such as Mercury, Mars and our own Moon. Most craters seem to be in remarkably good condition. The evidence of impact craters therefore seems to point to a hostile atmosphere which, as we have already seen, is clearly borne out by analysis of the atmosphere. But also the evidence suggests a global resurfacing event hundreds of millions of years ago, and a relative absence of volcanicity or erosive forces since that time. How this could have happened will be considered in the next section. 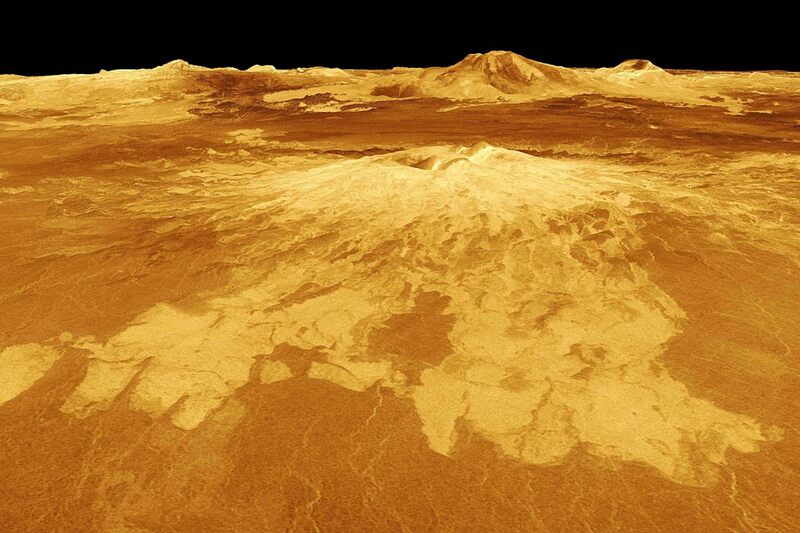 We already have established a rather confusing picture of Venus' s topography. On the one hand we have described how so much of the planetary surface seems to be volcanic in origin, covered as it is with great volcanoes and extensive lava flood plains. We have also talked about the mountainous regions as being deformed and cracked, as though under great stress. So it seems that the surface of Venus has been the site of great turmoil. And yet we have also said that the majority of existing meteor craters on the surface are in good condition, implying an absence of such extensive geological activity, at least in the time since the craters were made. All of the above may possibly be explained by the absence of plate tectonics on Venus. On Earth it has long been known how great sections or 'plates' of continental crust effectively 'float' upon the underlying more fluid 'mantle' rocks. As they move against each other, or alongside each other, so continents will drift apart creating depressions filled by oceans and seas, or else collide together creating mountain ranges. And along the edges of the continental plates, are zones of weakness which are characterised by earthquakes and volcanic events. This is why so many of Earth's volcanoes are distributed around the Pacific rim, and in a chain running down the 'spine' of the Americas at the edge of such plates. Away from the edges of the plates, the Earth is relatively rigid and passive. If there were no plate tectonics on Earth, the entire planetary surface would be relatively rigid and relatively inactive - just as Venus appears to be today. Already we have speculated about the possible absence of plate tectonics on Venus. We have suggested that a rigid, unmoving crust may be responsible for a lack of heat flux through the mantle, reducing convection currents. We have also seen how the distribution of volcanoes on Venus, suggests that they are associated with hot spots on the crust, rather than with zones of weakness at the edges of continental plates. These therefore are possible explanations or CAUSES for the lack of plate tectonics on venus, but equally the absence of plate tectonics may also have significant EFFECTS, and may offer possible solutions to the questions asked in the previous sections on SURFACE TOPOGRAPHY and IMPACT CRATERS. 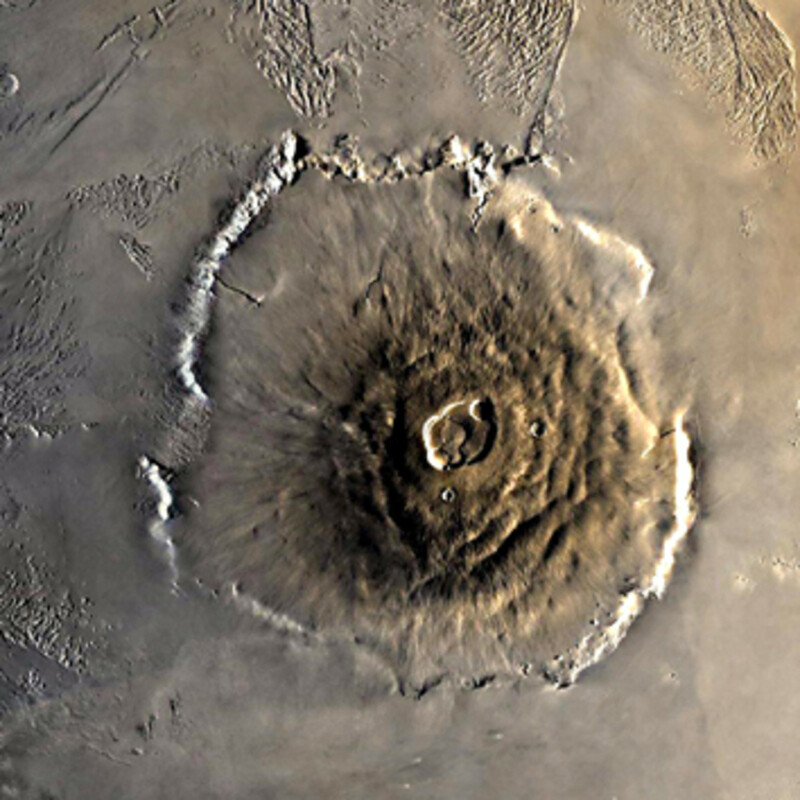 1) Hot spots beneath the crust are responsible for the formation of shield volcanoes, and will allow magma to pour out to form the great Venusian floodplains reminiscent of the Deccan and Siberian Traps on Earth. 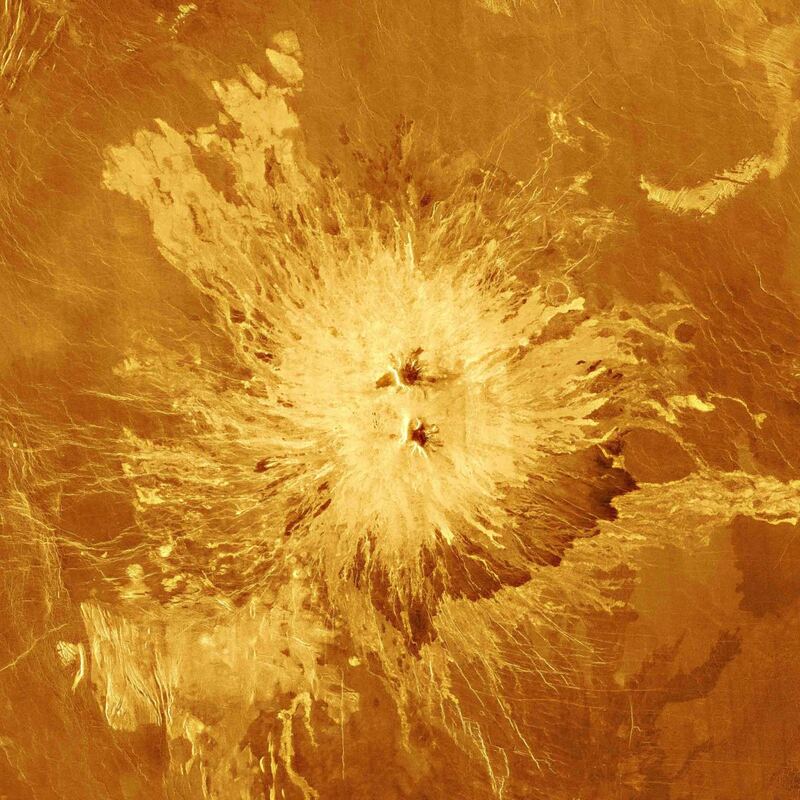 Such hot spots and weak points on the crust may create those other more unusual features of the Venusian landscape. The currently hypothesised method of formation of coronae is via plumes of hot material rising in the mantle, forcing the crust up into a dome shape. Subsequent collapse in the centre and weakening of the rim allows the escape of lava to create the crown-like corona. 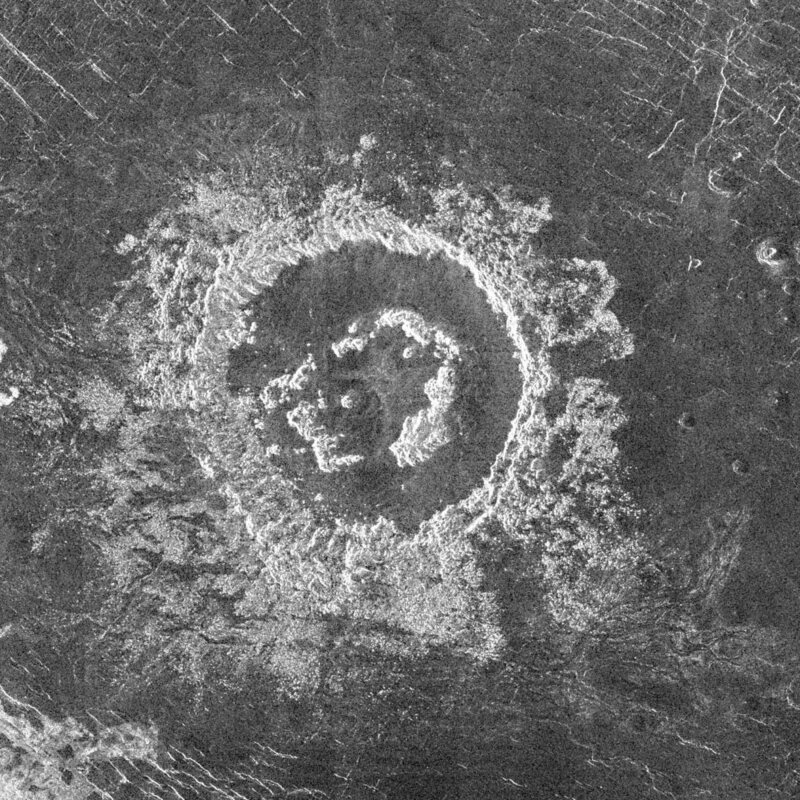 The characteristic radial or concentric ridges and trenches of structures like novae and arachnoids are believed to result from magma seeping through stress fractures. 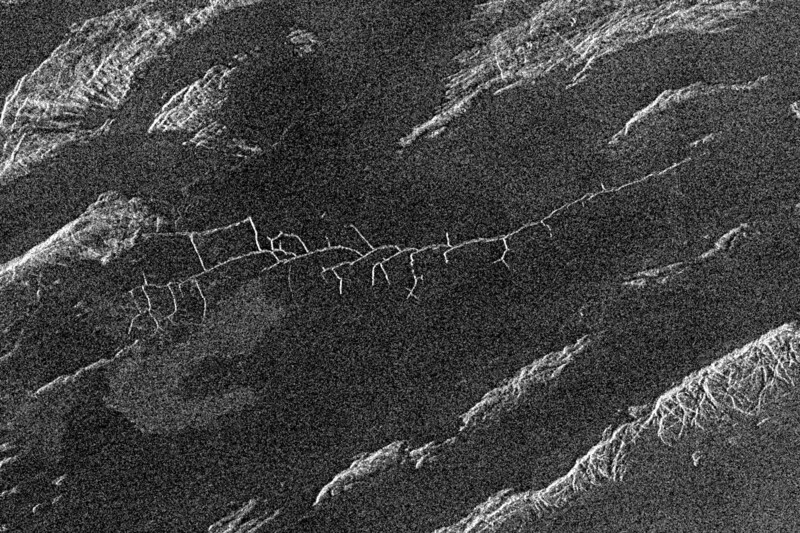 2) If the upland regions were not formed through plate tectonic-driven folding and faulting of the continental plates, then how did the uplands of Venus form? Well one possibility is that as a result of immense stresses built up under the rigid plate-free crust, vast pools of magma may force the crust upwards in some parts of the planet. 3) Building of pressure beneath the surface of a rigid planet to create the uplands, will also stretch and expand the crust and produce stress fractures. Release of stress and pressure through magma outpourings would lead to contraction of the crust. Such expansion and contraction is believed to produce the kind of deformed and fractured tesserae, characteristic of the uplands. 4) The evidence of impact craters suggests that pressure release through magma outpourings may not be an on-going event. Rather, it may be that at some time in the past, a massive outpouring of magma and global resurfacing of the planet may have occurred, effectively creating all the lava floodplains which make up 80% of the planetary surface, and obliterating all older features including craters. It would have been like one gigantic planet-wide Deccan or Siberian Traps eruption. Subsequently Venus may have been relatively dormant for hundreds of millions of years, allowing the number of more recent crater-creating impacts to accumulate to the present levels. The evidence of a lack of plate tectonics therefore may explain all of the geological formations we see on Venus, including the distribution and form of the volcanoes, the presence of other curious features such as the coronae, the great lava plains, the fractured uplands, and also the relatively small number of craters on the surface. We have now gathered all the available evidence and looked at the factors of Venus's physical characteristics, the lack of a strong magnetic field, the atmospheric characteristics and the lack of plate tectonics, which may have created Venus’s present day geology, topography and climate. However, it is now time to try to put this evidence together to create a surmised history of Venus from its origins to the present day. One should make clear that although the key events described are all generally believed to have occurred, the precise sequence, time lines and relative importance of some of the factors must currently be regarded as unproven. HISTORY OF VENUS - AN EARTH-LIKE PLANET? Up until this time, Venus's atmosphere is believed to have been comparable to Earth's. Substantial oceans of liquid water may have existed. Temperatures were higher, so greater evaporation would have occurred, but at this time temperatures are not thought to have been high enough for all water to evaporate, much less boil. Indeed water which did evaporate would have formed clouds which reflect heat, cool the planet a little, and perhaps could have allowed water to be retained on the planetary surface for at least a billion years. As a little aside at this point, the relatively Earth-like conditions on Venus more than two billion years ago, with water on the surface and copious water vapour containing oxygen and hydrogen in the atmosphere have led many to speculate that life might conceivably have evolved at this time. One particular physical entity has kept cropping up throughout this discussion, and that is ‘heat’. There are two sources of heat on a planet; the first is the internal heat of pressure and radiation, but there is no reason why this should be greater on Venus than on Earth. The second is the heat from the Sun, and this would have been higher - but not hugely higher - than on Earth. However, there is a way in which heat gathered from the Sun can be concentrated and escalated, and that is something which can happen if the atmosphere of the planet is of a particular type. At this stage the planetary supply of carbon become significant. Carbon was present within the planet's interior, and it is believed that much of the supply of carbon to the surface on both the early Earth and the early Venus came about through the release of carbon dioxide in volcanic eruptions. On Earth, much carbon became dissolved in the oceans, and bound up in the tissue of living organisms, to be released and recycled as water evaporates, or when organisms die. Very little combines with oxygen in the atmosphere. Any that does enter the atmosphere re-enters the soil when it is washed out in rainfall, or becomes bound up in surface rocks such as limestone. (this is the so-called carbon cycle - clearly inextricably linked to the presence of water). On Venus, the diminishing 'pool' of water as a result of the two processes of heat evaporation and then subsequent dissociation of water molecules in the atmosphere would have meant that this carbon cycle could not kick off. Instead, carbon atoms would combine with the dissociated oxygen atoms in the atmosphere producing carbon dioxide. Carbon dioxide is a renowned greenhouse gas. It allows heat from the Sun to pass through, but absorbs much of the heat reflected back, leading to an increase in atmospheric temperature. An increase in atmospheric temperature leads to more evaporation, more dissociation of water molecules as a result of the Solar wind effects, and more recombination of carbon with oxygen to further increase the concentration of carbon dioxide in the atmosphere, and therefore even more trapping of heat. This runaway effect or 'vicious circle' effect leads to escalating concentration and density of carbon dioxide in the atmosphere, continuously rising temperatures and accelerated evaporation of the planet's water (until all available carbon was combined in the atmosphere). As a by-product, the increasing concentration of the dense gas carbon dioxide would also have created the immense pressures which now exist on the planet's surface. Sulphur, released by volcanic activity common to both Venus and Earth, would further contribute to Venus's hostile conditions. On Earth, sulphur solidifies on the surface or becomes incorporated into surface minerals. 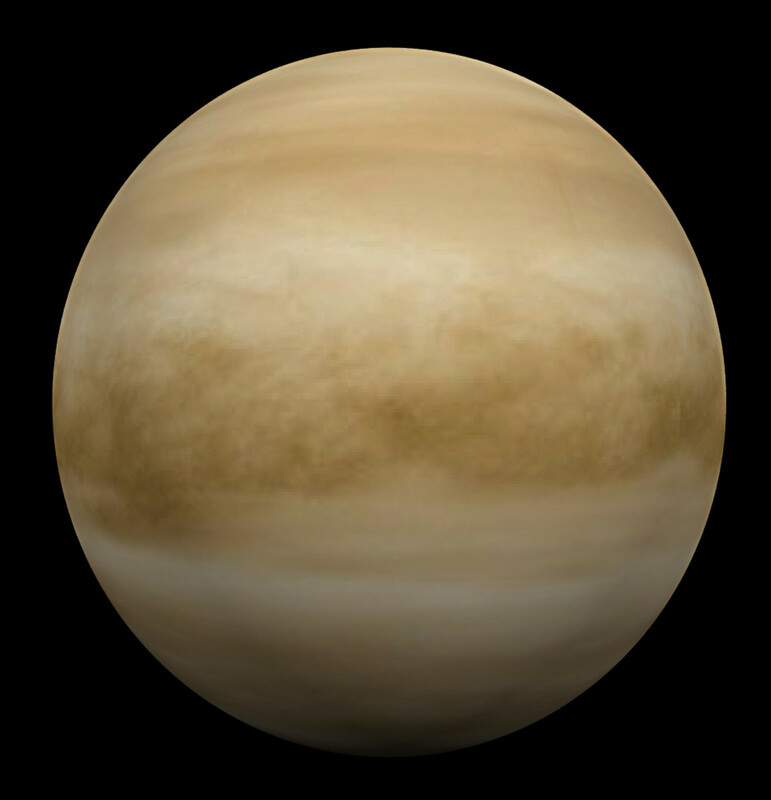 On Venus, temperatures would by now have been rising above the level at which sulphur not merely melts, but evaporates to combine with dissociated oxygen atoms to form sulphur dioxide, and clouds of sulphuric acid, and this would explain the concentrations of these compounds in the Venusian atmosphere. Sulphur dioxide can trap certain wavelengths of radiation which CO2 allows through, and thus would contribute further to the greenhouse effect, raising temperatures still further. The absence of a magnetosphere, the development of the carbon dioxide greenhouse atmosphere, and the gradual removal of all water from the surface are considered to have been three of the crucial elements in Venus's descent into a nightmare world. Remarkably, high temperatures in the atmosphere and on the surface of Venus would by now not merely have affected a volatile liquid like water; it would even be affecting the rocks of the surface crust and deep into the underlying mantle. On Earth, the mantle is a largely molten layer of rock which extends from the planet's outer core to within about 30 miles of the surface, just below the crust. Plate tectonics on Earth play a major role in recycling the crust and releasing pressures and heat from the mantle, creating the planet we know today. But plate tectonics requires a fine balance of conditions to exist, without which the mechanism may shut down. 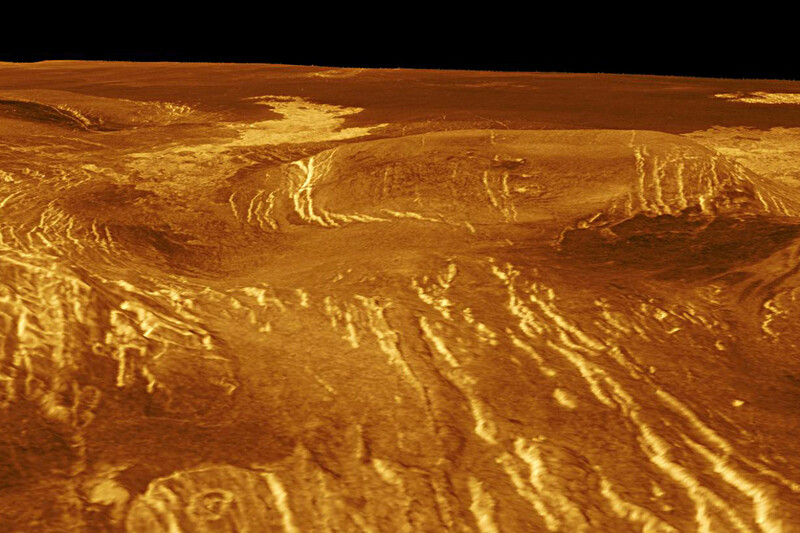 Ultimately, the occasional volcanic events creating shield volcanoes at hot spots on Venus, may not have been sufficient to counter the rising pressure beneath the rigid crust. Without the benefit of the regular, periodic pressure release which plate tectonics allows through volcanic events and earthquakes, build-up of heat and pressure may eventually have become unbearable. Between 300 million and 800 million years ago (based on impact meteor evidence), the rigidity of the crust would finally have been broken as cracks and vents opened across the entire planet. A vast outpouring of lava similar to - but on a scale unimaginably bigger than - the Deccan or Siberian events may have taken place. What's more, outpourings of lava, however massive in scale, would have spread even more extensively over the planet surface as extreme surface temperature would have contributed to a much slower rate of cooling and solidification, creating the ocean-sized floodplains which cover 80% of the planet today. In such an event, it is hardly surprising that all pre-existing impact craters would have been obliterated, as well as other low lying surface features. This global resurfacing probably took place over a period of tens of millions of years - a short period of time geologically speaking - so it seems likely that virtually all surface features on the planet with the exception of more recent impact craters, and possibly the upland regions, are of effectively the same age. 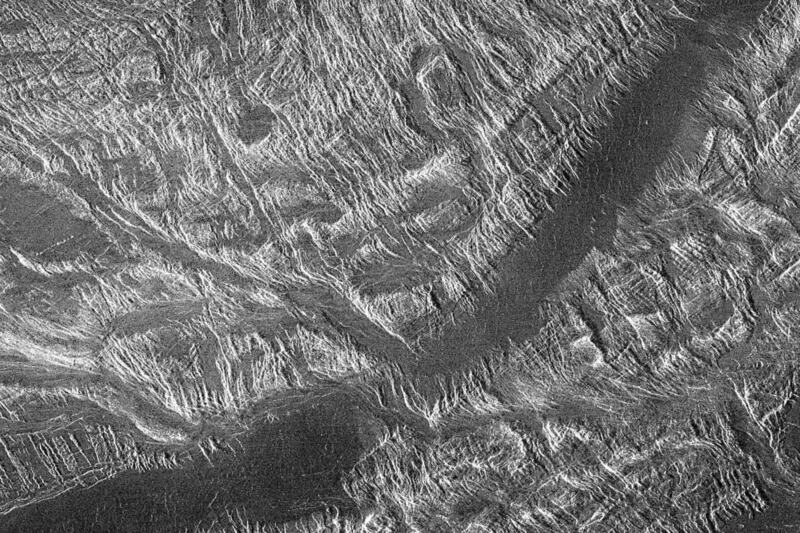 (It has of course not yet been possible to date any Venusian rocks accurately) Ultimately, the release of heat accompanying the global resurfacing would have allowed the surface to cool somewhat, possibly contributing to the fractured appearance of the surface, as the crust once more became rigid under a thick layer of solidified lava, and conditions once more stabilised. But perhaps not totally inactive. One study suggested that although more than 60% of all craters are pristine, others have been affected by upheavals of one kind or another, whilst 4% shows signs of lava disruption. And indeed, recent high resolution radar and infra-red evidence has identified what appear to be recent volcanic eruptions and ejecta from volcanoes  . Remember that in the section about Venus's atmosphere, we mentioned the presence of lightning in Venus's atmosphere? On Earth, lightning is associated with water rainfall. On Venus there is no water rain, but it has been suggested that sulphuric acid rainfall in the presence of volcanic ash can also generate lightning. Recent evidence also shows a significant drop in the levels of sulphur dioxide in the atmosphere between 1978 and 1986, the inference being that previous high levels of sulphur were the result of a volcanic eruption. One final question remains; was the resurfacing a one-off event, or could it be a cyclical phenomenon? The obliteration of surface features by the resurfacing several hundred million years ago means that it is impossible to know with any certainty what might have happened before this event. Was the resurfacing unique, or merely the most recent of a series of such events, removing all trace of previous resurfacings? And could another such event occur in the future? Beneath the surface the dormancy of much of the planet’s geological activity may have existed for hundreds of millions of years, but the evidence seems clear that Venus is far from dead. My guess is that at some time in the future, such a global volcanic event may well occur once again. Inevitably when dealing with the geology and climatology of an alien world which we cannot as yet visit in person, some questions remain unanswered, and some answers seem contradictory. It is impossible to know exactly what goes on at or just below the crust, let alone deep within the core, and we have no working model with which to compare Venus except our own planet Earth. Just as it's surface is shrouded in a dense carbon dioxide haze, so Venus's history remains shrouded in some mystery. But the driving force behind everything that has ever happened seems to be heat - heat from the interior, heat from the Sun, and above all else, heat trapped by the atmosphere. Following the loss of Venus's magnetic field, all the major events which have shaped the planet's history have been triggered by heat - the loss of the water, the development of a greenhouse effect, and the great volcanic resurfacing several hundred million years ago. The theme of this story has been how the one-time similarity between Venus and our own Earth has changed so drastically as a result of rather small original differences. Venus was a little bit smaller, Venus lacked a moon and rotated on its axis more slowly, and most importantly Venus was that bit closer to the Sun and hotter. Because of these differences, it seems Venus just could not sustain a potentially habitable environment, and is therefore perhaps the finest example - and a salutary lesson - as to how delicate the balance between planetary life and planetary death really is, and just what could go wrong with a planet like Earth if conditions were a little different to the way they are. 2] Why Doesn\'t Venus Have a Moon? Venus was long considered as Earth's twin, and compared by the ancients to the Goddess of Beauty and Love. However the truth has proved to be very different. Venus is the personification of Hell. Mercury - the closest of all planets to the Sun. At first glance Mercury resembles nothing more closely than our own Moon - a barren rocky world strewn with craters. But there is a bit more to Mercury than meets the eye. This is a beginner's guide to the surface structures on the Moon. There is more that can be seen on the Moon with a pair of binoculars, than in the whole of the rest of the sky put together. This guide tells you what to look for. In this fourth page of a series of guides to the night sky for beginners, I look at the most prominent objects other than our Moon and the stars which can be easily seen in the night sky. My interpretation of the Venusian atmosphere is slightly different. The question is, where did the volatiles come from? There is plenty of evidence Earth's did not come from comets or asteroids, so I assume the same applies to Venus. The atmosphere was not absorbed by rocks as gas and then released, otherwise neon would be about as common as nitrogen, and it is not. The inert gases, though will have been, but that is why they are rare on the rocky planets. In my view, the carbon and nitrogen were absorbed as solids, such as carbides and nitrides. Water was chemically bound in silicates and aluminosilicates, and earth has the most water because (a) it had plenty of calcium aluminosilicates, and (b) it was not as hot as Venus, which would make collecting water more difficult. The next problem for Venus was the atmosphere was to be made by reacting the carbides and nitrides with water, and any acids made by the water underground. (Volcanic water often has some sulphuric or hydrochloric acid in it.) The simple answer for Venus was that because it had more carbides and nitrides, it consumed more water making the atmosphere, and since it started with much less, there was little left over. The deuterium enhancement would come from the chemical isotope effect, which is far more efficient at concentrating deuterium than the usual evaporation of the oceans scheme. The basic reason why there is so much CO2 in the Venusian atmosphere is there was very little water left to dissolve it, and even if it did, there was insufficient accessible calcium for quick weathering. Accordingly, there was no mechanism to fix it, and it just built up. Once the Greenhouse effect got over 35o degrees or so, weathering of basalt would not fix it, so there we are. It is a consequence of chemistry that applied to what made Venus. Derdriu - thanks as always for your much appreciated comments. Of all that you say, I'm particularly glad you used the word 'clear' in your comment. This was by far the longest and most complex page I've ever written - sometimes I struggled to understand what I was writing myself !!! (particularly the bit about the magnetosphere - much too much physics for my liking :-) It's always difficult to gauge how an article might read to fresh eyes, and I worried about whether what I was writing would make any sense to anyone. As far as future pieces are concerned. I'm currently trying to write one about the Earth, but of course it's quite different in tone. It will be about what makes Earth unique as a habitable planet. Hope I'm up to it!! But I'm also writing a set of 4 beginners' guides to the night sky, which should hopefully be rather easier and quicker to complete. Greensleeves Hubs: Venus has led a very hard life! Who would have guessed that such ethereal grace progressing slowly but beautifully and steadfastly through our system hid such indomitable courage in the face of breakdown, loss, turmoil and violence? Your much-anticipated article rewards readers with clear, fascinating, intelligent contrasts between the sister planets, so alike in origin and so different in experiences and evolution. P.S. Will Earth or Mars be next in your line-up of planetary hubs? Perhaps harnessing the atmosphere itself to protect against Solar radiation as in the example of ozone which you give is the answer. I wonder? 'Wild-eyed amateur'? No more so than me, and to be honest, at this stage of our planetary exploration when we are only just beginning to explore the possibilities of terraforming planets, I suspect everyone is essentially an amateur in terms of being able to provide authoritative answers. As for actually staying on Venus, it has a much much thicker atmosphere than Earth's and the Soviets, who were really big on Venus, had some "floating city" projects as I recall. Reminiscent of that floating mining colony in Empire Strikes Back in fact. Hi teriyaki. Thanks for your comment. I think you may well be right. 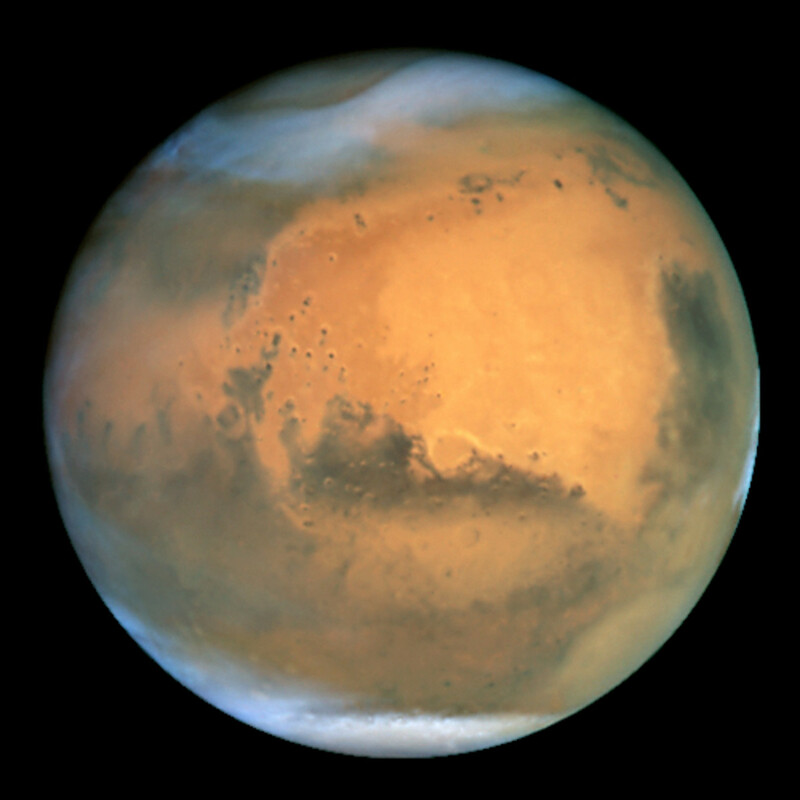 Of course today Mars is a much more benign destination for a visit and even a manned base, as well as a far better bet for finding microbial life extant or extinct. But Venus at least has a substantial atmosphere with plenty of oxygen atoms, albeit currently bound up in destructive carbon dioxide molecules. So maybe it would be possible in the future to put the process described in my essay into reverse and break apart carbon dioxide molecules and generate water molecules. Not sure whether it would be possible to protect the terraformed planet and its atmosphere (and any new inhabitants) from the effects of the Sun's radiation in the absence of a magnetosphere, however. Somehow, I guess an artificial magnetosphere might have to be generated? A massive and very interesting hub! I was always fascinated by our neglected sister planet, much more than that cold irradiated rock ball called Mars that everyone seems to be talking about. I'd really love to see a well informed comprehensive article on the possibilites of teraforming Venus. Apparently it would involve simply seeding the upper atmosphere with bioengineered bacteria which would slowly eat all the bad greenhouse gases and eventually produce a breathable earthlike atmosphere along with plenty of water. This scheme seems much more practical and realistic than "heating the freezer in a dark basement" techniques that would have to be applied to Mars.